Applied Iterative Methods discusses the practical utilization of iterative methods for solving large, sparse systems of linear algebraic equations. 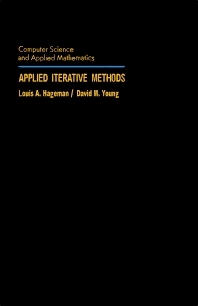 The book explains different general methods to present computational procedures to automatically determine favorable estimates of any iteration parameters, as well as when to stop the iterative process. The text also describes the utilization of iterative methods to solve multidimensional boundary-value problems (such as discretization stencil, mesh structure, or matrix partitioning) which affect the cost-effectiveness of iterative solution procedures. The book cites case studies involving iterative methods applications, including those concerning only three particular boundary-value problems. The text explains polynomial acceleration procedures (for example, Chebyshev acceleration and conjugate gradient acceleration) which can be applied to certain basic iterative methods or to the successive overtaxation (SOR) method. The book presents other case studies using the iterative methods to solve monoenergetic transport and nonlinear network flow multidimensional boundary-value problems. The text also describes the procedures for accelerating basic iterative methods which are not symmetrizable. The book will prove beneficial for mathematicians, students, and professor of calculus, statistics, and advanced mathematics.